Race mornings you’ll either find me tearing the house apart looking for some Shot Blocks or sitting calmly eating a bagel and waiting for my time to head out the door. I can never predict if I’ll be a frantic mess or a zen being ready to run, so I try to prepare myself as best I can ahead of time. Yes, I remind myself to check the weather. There have been a couple of times that I’ve ran out of the house dressed for the wrong race. If my house is hot, I’ve assumed it’s hot out. If there’s a sprinkler on, I think it’s raining. So now I check the weather the night before and set out appropriate attire. By the way, tomorrow is going to be perrrrrfect at 7 AM. I picked up my bib earlier today at Track Shack. I managed to sign up early enough to get my name of my bib. And check out that nice low, even number. This must mean good things lie ahead, right? Afterwards I stopped and picked up one bagel from the Publix bakery for my breakfast in the AM. Yes, ONE bagel. We don’t buy bread for the house any more because we don’t eat it much, so if I bought an entire pack of bagels it would go to waste. I know this because I’ve wasted many a pack of bagels. Next I came home and tossed my running clothes in the washer and started to plug in all of my electronic devices. My iPod Shuffle is charging and my Garmin is plugged in as I type. My running belt, sunnies, sunblock and earbuds are laying out so I don’t forget them. And while I waited for D to get home so we could have dinner, I ate a fortune cookie from last night’s Chinese dinner. This is so perfect in so many ways. 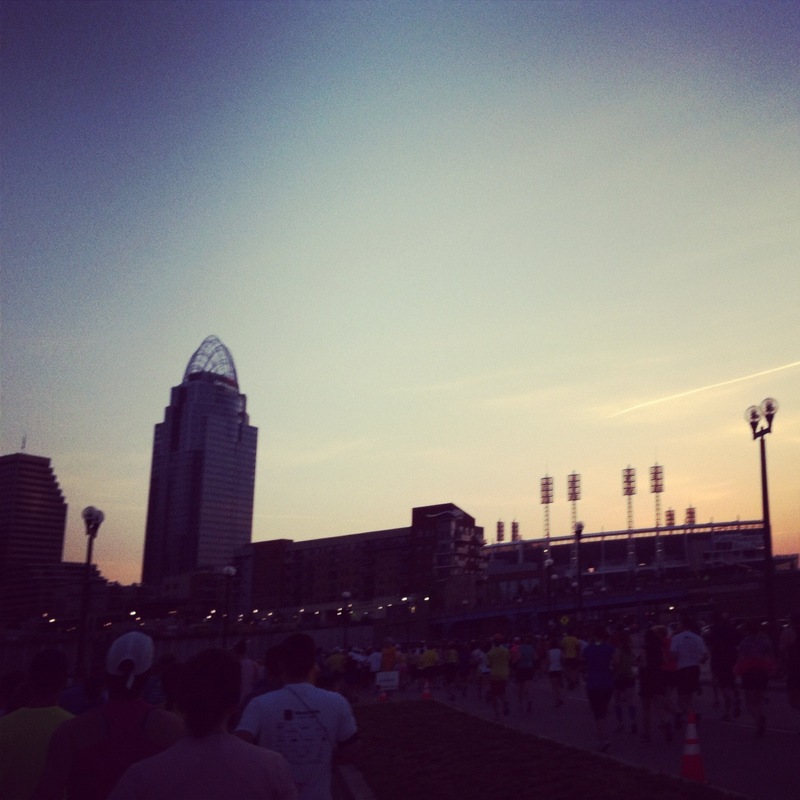 Tomorrow morning I’m going to cross that start line and do just that: what I can, with what I have, where I am. Good luck tomorrow to all my fellow runners of the Orlando Half Marathon! 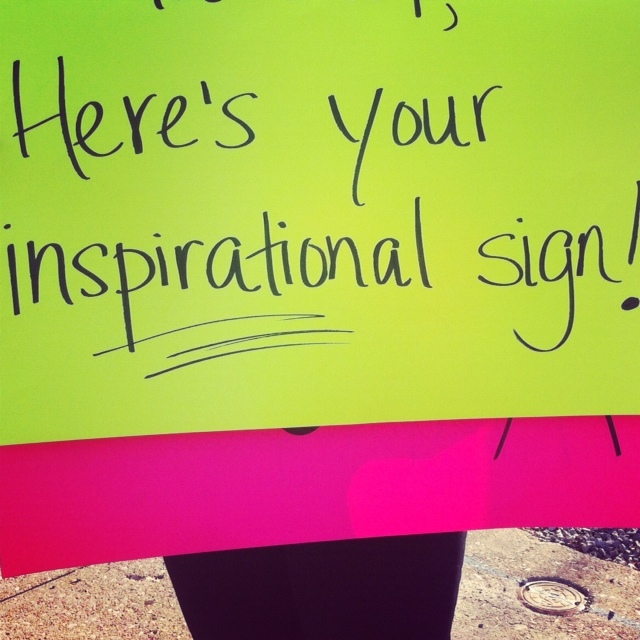 One of my favorite parts of running any race are the signs along the way. I don’t know what it is, but as a runner, words written on a piece of poster board can be so helpful when you need it the most. They either make you laugh or shout absurdity’s to its holder, or if you’re just plain delirious and tired you might cry. For just a moment in time, they distract you from the task at hand (running many miles) and focus your attention elsewhere. A few years ago, the OUC Half Marathon course took runners right by the end of our street. My friend was running it, so we made sure to make a poster. I like to do one side of the poster name specific for friends, and the other side just plan ridiculous for the rest of the runners. The reaction from the freezing, scantily-clad runners was hilarious and this is one of my favorite race posters that I’ve made to date. 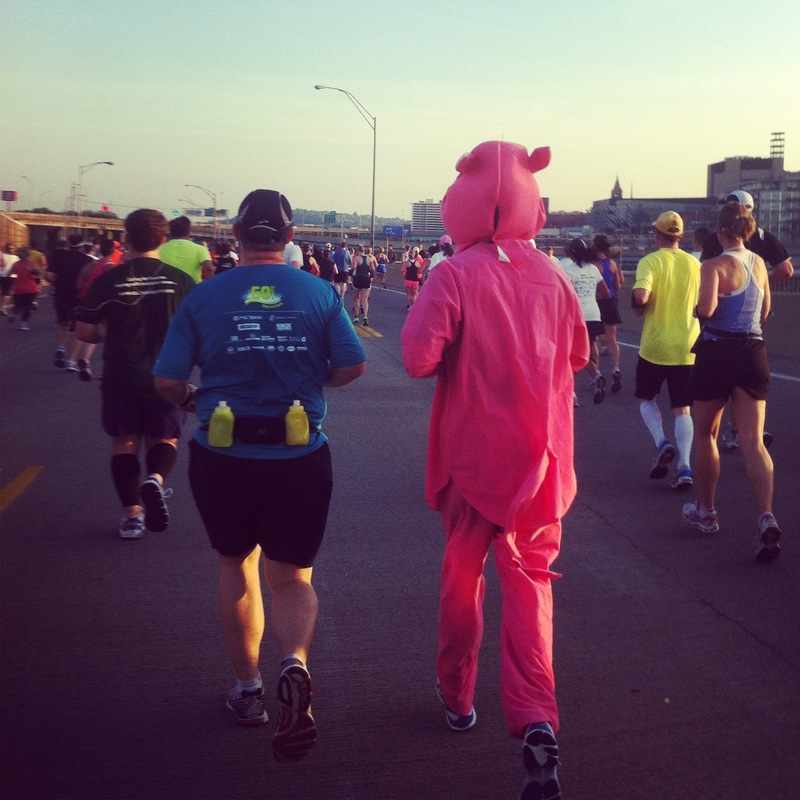 There were tons and tons of great signs at the Flying Pig Marathon. I got pictures of my favorites when possible. I’m always a sucker for a little potty humor. A special shout out to the sign that read “I’ll be your support” and had a drawing of a bra and a jockstrap on it. I was too busy distracted by beer to get a photo. Which race signs have been your favorite?